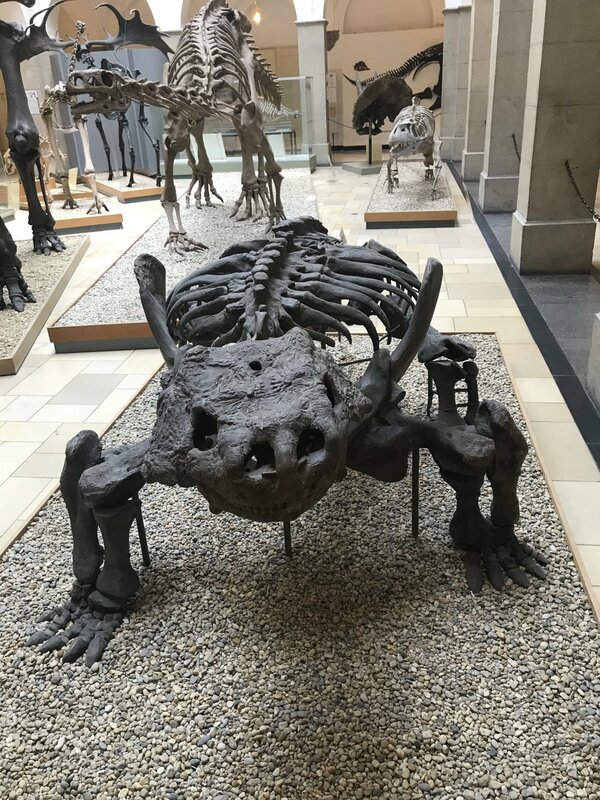 I went to Munich for the first time last week and decided to check out some of their natural history museums. I visited the famous Museum of Man and Nature on Sunday and as expected really enjoyed it. It's a great museum for children and adults alike and definitely worth visiting. However, I decided to write about the rather smaller but oh-so-very-exciting collection of the Palaeontological Museum. As part of the 175th anniversary of the Bavarian State Collection of Palaeontology and Geology, the Munich Palaeontological Museum is currently showing a special exhibition called 'Palaeontology and Geology Through the Ages'. The exhibition showcases skeletons of reptiles and mammals from different periods, including ichthyosaurs, dinosaurs, pterosaurs, giant deer, cave bears and saber-toothed cats. The exhibition is mostly in German with a few bits in English here and there. 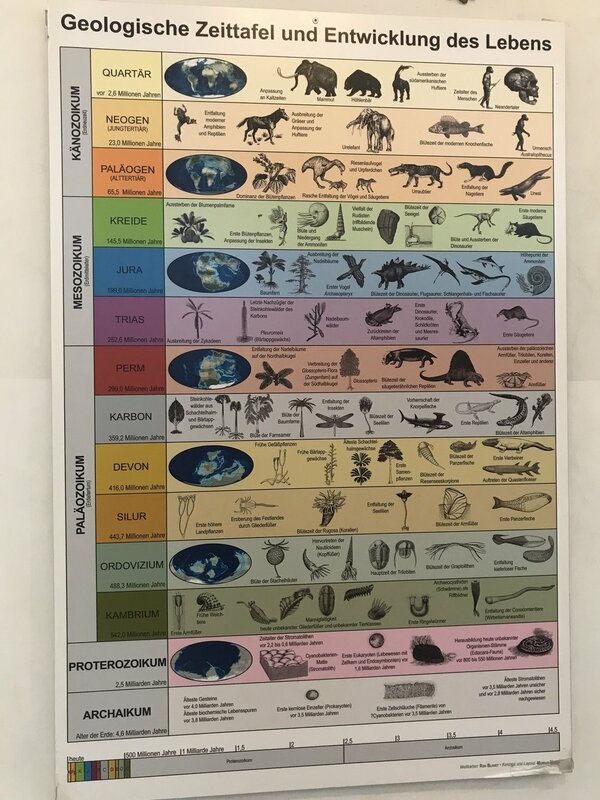 However, if you know even a little bit about Palaeontology such as the different periods, eras and the Latin names of few species, you'll be fine. It's worth noting that the exhibition is on Palaeontology AND Geology, so there is a lot more than the few parts I will cover on this post. However, like the Palaeontology-enthusiast that I am, I just have to focus on the parts that I was most excited about. These not so little guys have a special place in my heart. Their remains were first discovered by Friederich von Huene, a German Palaeontologist, in a place called Sao Pedro do Sul, in the state of Rio Grande do Sul in Brazil. They were part of the ruling reptiles (archosaurs) and their lineage leads to modern day crocodiles. They were dominant land predators in the late Triassic period and were eventually replaced by dinosaurs during the the Triassic/Jurassic boundary. Despite their appearance, these guys were herbivores and come from the 'bird-hipped' dinosaur lineage known as Ornithischia. They flourished in the late Cretatious period and were the latest largest representatives of the the horned dinosaurs known as ceratopsians. There's always been a lot of debate as to the function of their horns and frills. However, the current consensus is that these were primarily used as display organs with only a secondary defense function. These 'cave bears' occupied Europe in the Quaternary period where they used to hibernate and give birth to their offspring in the caves. Their closest living relatives are the Brown Bears. These majestic Quaternary period creatures were one of the largest deer to have ever lived. Their antlers would have a span width of 3-4 meters and a weight of 40 kilograms. A large number of their skeletons have been found in Irish bogs, including the one in the image (according to the museum's note). Their closest living relatives are the Fallow Deer. Also known as the 'ancient saurian', these so called parareptiles lived in the Permian period and were one of the first successful lineage of fully land-living vertebrates. There are some claims that they are closely related to modern turtles but this is still debated. Also known as the 'Giant Moas', these guys flourished in New Zealand in the absence of mammals (other than bats) during the Quaternary period. They were flightless birds that could reach up to 4 metres in body size. The museum's notes claimed that moas were hunted by the aboriginal Maori for their met, eggs and bones, and died out only 200 years ago. Famously known as the saber-toothed tigers or cats, they inhabited the Old and New World during the Ice Age. Their teeth were up to 20 cm long and they could open their mouth up to a 120° angle. The youngest fossil on record was found at the bottom of the North Sea and is 28,000 years old. In North and South America, they survived until the end of the Ice Age some 11,800 years ago. 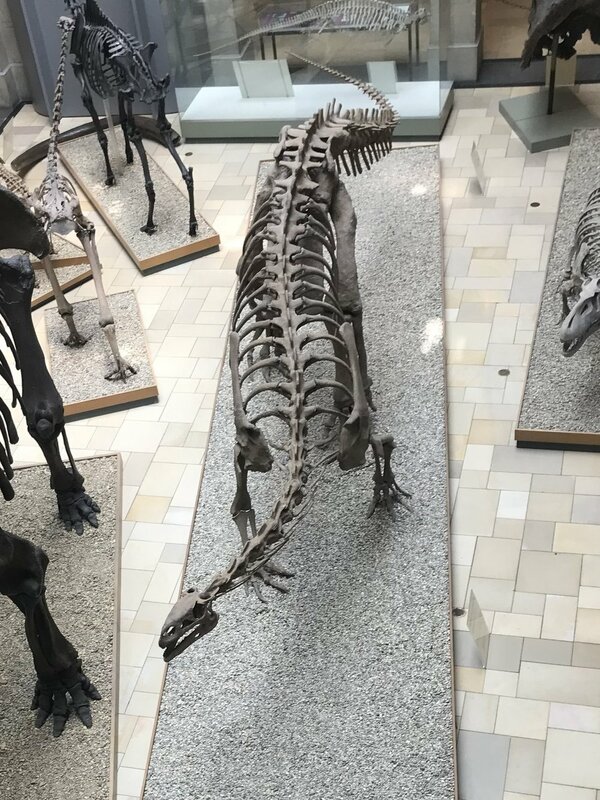 The museum's note stated that the skeleton on the photograph is 30 million years old and shows all the characteristic features of living Sea Cows, except for the presence of a small (still present) hind limb. This is quite extraordinary since 50 million years ago, Sea Cows had four complete limbs and were able to walk on land. 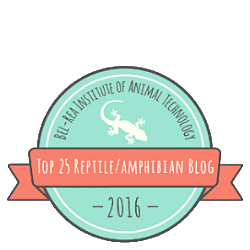 Interestingly, their closest living relatives are actually elephants! The flying reptiles of the Mesozoic era were not actually dinosaurs, though they were closely related to them. They ranged from the late Triassic to the latest Cretaceous periods where late forms such as Pteranodon reached giant sizes with a wingspan of up to 7 metres. To finish it off, these long-necked herbivore dinosaurs were one of the first successful full dinosaurs to have lived in the late Triassic period. Mass accumulation of skeletons were found in Germany and Switzerland, including at the site of Ellingen in northern Bavaria. This accumulation of skeletons indicate that they may have lived in groups. They were one of the largest animals of their time, with later relatives becoming the largest land animals to have ever inhabited the Earth, reaching lengths of up to 40 metres and weights in excess of 70 tons. Thank you very much to the staff of the museum who let me visit the area closed for refurbishment! I would also like to highlight that the information included in this post comes from a combination of my own reading and the notes from the museum. However, Palaeontology is most certainly not my expertise so if you notice anything amiss, do let me know!